You must make reservations at least 5 minutes in advance of the time at Romano's Macaroni Grill - Otay Ranch. My family and I went to have Easter brunch. We were a party of five and three of us ordered the eggs Benedict with the pesto hollidase sauce. The bread that the eggs and prosuito came in was so over toasted and very hard. The description on the menu states potatoes but instead we were given French fries. All three egg Benedict plates were cold and very unappetizing. We will never be having brunch at this restaurant again. What a huge disappointment. A good spot for great food and service. Specially if you’re trying to get away from all the loud places. Always enjoy the delicious food and look forward to our next visit. Restaurant was nice/clean; Service was slow (maybe because it was 7:30 on a Monday night). Food was dry/overcooked and poor flavor. Even my niece who insisted we go there while visiting since the Indy location closed thought food was not that great. However, the bread was fantastic! I went for the Thursday special that they advertise online. Wen I got there I was told that "sorry not this Thursday the manager decided to change it" for something ofcourse more expensive. I don't like false advertising. I just walked out after I was told. First time I've eaten at a Romano's that wasn't the Temecula one, which has set the bar high, it seems. Food was as tasty as always, but the service was a touch lackadaisical, especially considering the uncrowded state of the place. And I realized only after we left that our server totally forgot to ask us about either the soup or the salad that are included in the entrees! We had plenty of food (both of us took a container home), so it didn't really matter—but it still should have been mentioned. We had a reservation and had to wait 30 min to be seated. We then waisted 1.5 hours for our appetizers. We then asked for the rest of our meal to be boxed up. Our meal was not even comped at all, even after having to wait so long for our food. Despite my reservation I still waited another 30 mins to get seated and another hour for my food to come out. We had a 7 pm Reservation, we asked for a particular server that we knew was great, we didn't get seated until 9 pm. We were a party of 2, while others were seated in same server section as we requested. Still over all had a good time, our server Keven was excellent. Very slow service on Valentines Day. Had reservations for 6:30, showed up a few minutes before and was seated close to 7pm. We sat for an hour and a half before getting our food. While the waitress did not refill our drink for about an hour, she did express her embarrassment for us having to wait so long. She said she spoke to the manager, who agreed to cover or check. Considering that we did not eat until close to 9pm, Im glad I did not have to pay but they should really be prepared on days they should know to expect a lot of people. They got one of our orders wrong, my sons meal came 10 minutes after everyone elses, and my dinner was salty and soggy. New menu item sausage tortellini was excellent. The B&B salad was very good too. Briana, our server, was attentive and helpful explaining menu items. The house Bianco white wine was light and refreshing. Although we had to wait a little while for our reservation (new year's night) which is understandable, once we were seated the waiter was so attentive and nice and the service was fast and we had all our food so quickly and the drinks were the best I've had from the bartender. My husband and I stayed over 2 hours it was a great night. We had a Christmas dinner with friends. Excellent ambiance and great service by Santino. The menu is varied and a good value. Service has improved significantly over the past 8 months. Well done. 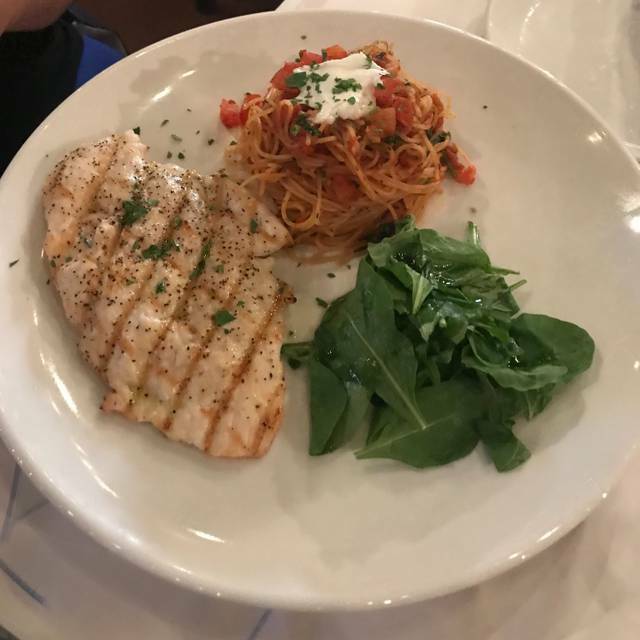 Macaroni Grill has been running a special lately on Thursdays that includes two drinks (including alcoholic), two entrees from a limited menu, and a dessert for $40.00. They also offer the option to order an appetizer with the meal for an additional $5.00. We have gone a couple of Thursdays and have found it to be a pretty good deal. Food is solid and service is good. Nice to enjoy a good meal at a value price. I used the app to reserve my table. I checked in 6:55pm for 7pm reservation. it was 7:15 when I asked how much longer the wait was since people were being seated that had arrived after us. Turned out they did not register me that I had arrived. My lobster brisk was cold. I didnt have napkins on my table, i had to ask for some. We have been dining here for several times but last Friday wasn’t really good to ask and leave a reviews. Even if they are busy because of Friday they should prepare the table neatly and nice. I lost my appetite when I see the way they prep the table I even took a picture to share the other consumer it so disgusting when you see the other part of the table not properly covered either their table cloth. And I looked at the other tables, thinking they probably discriminate us because we are Asian? The reason why the table is not properly prepared or neatly prepared? One of the reasons why we always comeback here (or to other restaurants) is because of the cleanliness of the restaurant. But this restaurant for that night 👎🏻👎🏻👎🏻👎🏻 on the 1st picture even if against the wall, still noticeable.... yes every restaurant are busy but I know this is so simple mistake but for me who is so particular on how the restaurant prepare the table(set up), cleanliness and aside from the service and the quality of food are one I’m looking up too to keep on going back. MG is a favorite. Always good food and drinks. This location is probably my least favorite. Always seems to be understaffed or running behind but it’s our favorite food! Food tasted great, and the restaurant decor is wonderful. Unfortunately, every employee we interacted with seemed to be in a very bad mood. In short, the food was great, but the service was terrible. This restaurant has so much potential to be great, but in currently falls far short in terms of customer service experience. When we made a reservation on Open Table, 5:45 was available. However, I was concerned that we might not arrive until 5:50, so we settled on a 6:00 time. We ended up arriving at the restaurant at 5:45 because travel was quicker than anticipated. Although there were many empty tables, we were told we must wait 15 minutes until our "reserved time". Our effort to make a reservation turned out to be a total waste of time, and staff had a "don't care" attitude. Once we were seated, we didn't receive the complementary bread for at least 30 minutes (after drinks, and salads were served). When I was served my salad, the server left the table before realizing that we had no napkins or silverware. Not wanting to eat salad with my fingers, I waited 10-15 minutes for the server to return so I could request silverware. When our food arrived, we were informed that our sons' pizza was dropped on the floor and would have to be remade. I was thankful that they remade the pizza instead of serving us food that had fallen on the floor, and they comped us the cost of the pizza. However, it was still inconvenient having the three adults eat while the 11 and 13 year-olds sat hungry. They don't like adult food which is why they ordered a plain cheese pizza. Bottom line: Paying over $100 for a meal (3 entrees) with service this poor is not one's expected experience. We won't be going back. The pizza I ordered was mainly crust. Also had to ask twice for soup that was part of the unlimited soup or salad meal. We may not return. Food was great. Service was good, but the salad and soup appetizer never made it to the table before the entrees. We actually arrived like 15 minutes early and still managed to seat us! And service was quick and friendly. Arrived 5 minutes before our reserved time. Even though table was ready, and there was NO WAIT the hostess said we needed to wait 5 minutes because we arrived early. Soup was cold. And even though their menu says unlimited soup, I got a small portion and I was not offered more. They just took my plate. New management is absolutely horrible!!! You must have a reservation ti avoid the ling wait. Food is good but not great, but would return since is conveniently located. Food was delicious as always, we went to celebrate Mexican Mother’s Day and the restaurant was not prepared for the large crowd that day they were under staffed and the wait to get our food was longer than normal. Our waiter was really good he did his best to accommodate all the busy tables. It was a very good meal however, the service was not up to par, the lasagna was cold, one of our plates was served extremely late, we had to remind our server to refill our drinks at least twice before having her do it. They seated us quickly and the food was served in a timely fashion. I reserved a table and when we got there, no reservation found. But I have my confirmation. Disappointing. Glad it was not busy at the time. Server seemed like he was new but did a ok job. Food was absolutely amazing! Our waitress was great! Love love love this place! All 10 of us in our party enjoyed the food! It was all very delicious. The service our waitress Courtney provided us was exceptional! She was patient with us and very responsive to our needs. We love macaroni grill in Otay Ranch and will continue to come back on a regular day or for special occasions. Thanks!